ShinyLoot's creator is discovering that even with big sales and unique features, the digital distribution arena is tough to break into. ShinyLoot launched last month as a digital storefront boasting some creative features and dedicated to helping gamers discover indie gems. Since launch the website has been offering an onslaught of sales on most of the titles in its library, but according to the site's creator, the competition is stiff when it comes to the digital games market. Despite suboptimal sales for the first month, ShinyLoot creator Chris Palmarozzi has received a lot of positive feedback encouraging him to keep pushing forward. "We expected sales to be higher for our first month," Palmarozzi admits, "but that may have been unrealistic given the market competition. In terms of quality of response though, I feel like we exceed expectations." Users say they appreciate the site's filter system, which allows games to be sorted by traits like "Empire Building" and "Deduction" to help users discover lesser-known titles. ShinyLoot stands out due to its firm anti-DRM stance, though it also provides Steam and Desura keys for many of its games. The community reaction to that policy, Palmarozzi says, is "all over the place." "Some of ShinyLoot's visitors come and find out that only a portion of our library has Steam keys and then leave pretty quickly. Some feel like we're an unneeded version of GOG ... The impact with developers is all positive though. 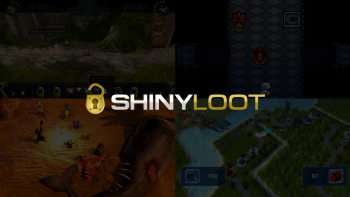 Since we don't have a client or any sort of DRM for developers to wrap their game files with, it makes uploading to ShinyLoot very easy." ShinyLoot's launch sale is coming to a close this weekend, with about 300 games on sale until Sunday, October 6. There's still time to score some deals before then to support indies, though the site will continue to host weekly sales - with each weekend highlighting themed collections of games with similar traits.